A new author has decided to send some stuff our way in regards to the new Series on the USA network called Suits. The Mad Hatter has put together a few words with his thoughts on the program, and I think we’ll agree he does a fine job here, let’s hope comments and feedback encourages the man to write some more for newmanfilms and get his name out there! The USA Network has demonstrated a remarkable penchant for launching TV drama and/or action series that quickly become major hits with viewers. These sensations include White Collar, Covert Affairs, In Plain Sight and the most recent addition to the line-up, Suits. It is understandable that a viewer's first reaction might not be very enthusiastic about another show revolving around a fictitious law firm, but a closer look would reveal a very unique story plot. 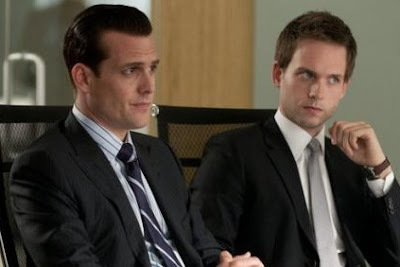 Suits is centered on a young man by the name of Mike Ross, (played by Patrick J. Adams), who made a few missteps early in life and was diverted from his college studies in law school. In a somewhat comical opening episode, Ross finds himself fleeing from the police and in his haste to make his escape, he stumbles into an office where a senior partner of a law firm is interviewing potential associates. With his photographic memory and Mensa IQ, Ross lands the position although he has no law degree. The senior partner who decides to hire Ross is Harvey Specter, (played by Gabriel Macht). He is so impressed that he overlooks the minor detail of Ross's lack of a law degree and becomes Ross's mentor at the firm. In subsequent episodes, the viewer is treated to very original situations which are entirely plausible if one dismisses the premise of a law firm actually hiring an associate without a degree; (however, the plot does address that circumstance in a very cunning manner). Other characters in the show include a partner by the name of Louis Litt, (played by Rick Hoffman), who is sarcastic, suspicious, envious and downright nasty. He is a virtual tyrant in his treatment of junior associates. There is also a budding romance between Ross and a young female associate. Click the picture to visit the official site.